Le Maine Libre Le Mans 2008 Pole Position Poster - Peugeot 908 HDi FAP. 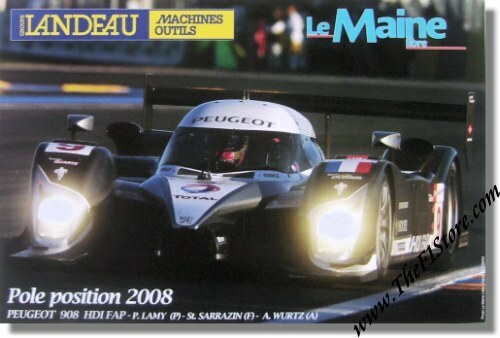 Issued by Le Maine Libre, a local Le Mans newspaper, it shows the Peugeot 908 HDI FAP of Pedro Lamy, Stefane Sarrazin & Alexander Wurz who achieved the pole position for the 24 hour race in 2008. The car would finish the race in third position with a total of 368 laps to its name.